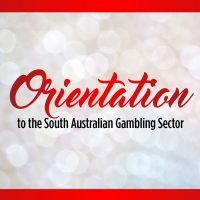 The Orientation to the South Australian Gambling Sector is a free online learning program designed for workers in the Gambling Sector, as well as workers in other sectors, to increase understanding about gambling problems and help identify clients affected by problem gambling. This introductory course is accessible to anyone with an interest in gambling and problem gambling. The online learning program is funded by the Office for Problem Gambling and hosted on the Australian Institute of Social Relations learning management system. This program will be updated each year to ensure the currency of information provided.